Description - Fireflies at Riverview Haven: Our cabin is located in Wythe County Virginia along the New River waterfront across from the 57-mile New River Trail State Park . The New River is 350 million years old and retains the pristine beauty of an unspoiled waterway. 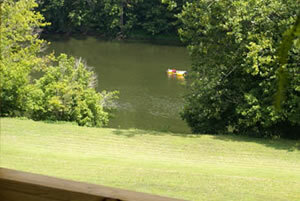 Enjoy canoeing, tubing, kayaking, hiking, biking, horseback riding, or fishing. Fireflies is situated mid way between Wytheville and the Christainsburg// Blacksburg area both of which offer many dining and entertainment options. 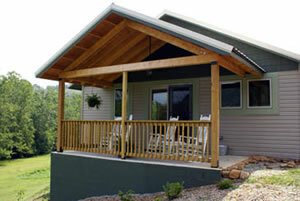 This romantic cabin is made for two but can accommodate four. The cabin rests above the water not far from a bend in the river. You can watch the sun come up over the mountain and the mist rise above the river while sitting on one of Fireflies' two porches. 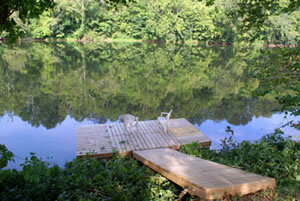 Visit the floating dock and gaze at the river as it travels a never ending journey north. You may be treated to the sight of fish leaping into the air or turtles enjoying the sun. 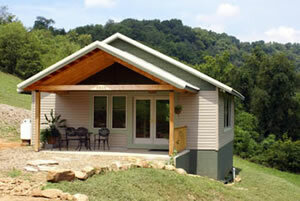 One visit to Fireflies at Riverview Haven and you will find a sanctuary to relax and enjoy the gifts of nature.